JACKSON HEIGHTS — Ismael Bastida graduated from NYU with a degree in dentistry in 1990, the same year the 82nd Street BID opened, promising to help revitalize and increase economic development in the area. By the time he opened his dental practice in Elmhurst 16 years later, the stretch had deteriorated: drugs, litter and graffiti had taken over 82nd Street, south of Roosevelt Avenue. Bastida became pessimistic about the neighborhood's chances, and his concerns, he said, fell on deaf ears at the BID. "We never had any communication with them," Bastida said. "We tried to talk with them, we placed complaints, and they never paid attention." 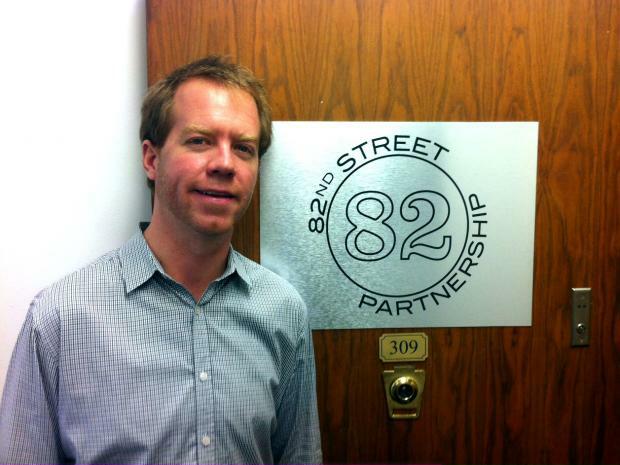 But over the past year, that disarray and lack of communication has given way to a new regime, new commitments and a fresh start at the now-rebranded 82nd Street Partnership, headed by a veteran of the powerful 34th Street Partnership in Manhattan. Now the Partnership is in the process of redesigning Dunningham Triangle, which is on the south end of the district. And in the coming weeks, there are plans to install new benches for people to sit and bike racks so the delivery bikes aren't chained to street signs and meters. The new executive director, Seth Taylor, who has been associated with a number of BIDs over seven years, has worked to rebuild connections with local small businesses while trying to come up with a new vision for 82nd Street. "When we look back on 2012," Taylor, 33, said, "we frame it as a rebuilding year." That rebuilding ranged from rebranding the BID with a new name and logo to replacing bricks in the sidewalks and removing graffiti. "When I stepped in here, I was surprised by the way the district looked," Taylor said. "It was clear to me that the BID and its staff were not doing much in the way of working with business owners, city agencies, property owners and residents to enhance the quality of life." That sentiment was echoed by Rob Walsh, the city's Small Business Services commissioner, who called the district "in neglect," according to one report. “Benches were broken, trees were missing, and graffiti was on storefronts,” Walsh told Crain's New York Business in April. So after the ouster of Sharada Devi, the executive director at the time, in December 2011, Walsh brought in Taylor, a Park Slope native who had never even seen the neighborhood before. Taylor's extensive background in business improvement districts includes two years at the 34th Street Partnership, three years at the Downtown Brooklyn Partnership and a year at the Union Square Partnership, where he began working after graduating from Pratt Institute in 2010 with a master's degree in urban planning. During his first visit to 82nd Street, he said he "was struck by the vibrancy of the district, and the potential it had." One of Taylor's first jobs as executive director was assigning a private team to clean the trash in the neighborhood, acting not only as sanitation workers but as ambassadors, the Partnership's "eyes and ears" to the area. Between March and August, the 82nd Street Partnership says it cleaned up 597 incidents of graffiti and cleared a whopping 308,290 pounds of garbage. It also painted 168 pieces of street infrastructure, including light poles, hydrants and street signs. The Partnership set up a horticulture program, too, turning large, empty planters that were being used as garbage cans on the streets of Jackson Heights into flower pots. Slowly but surely, the public began to notice. "I've seen a lot of people cleaning," said David Weiberten, 27, who moved to the neighborhood 10 years ago. "Whoever's doing this job is doing it little by little, and it's changing." Donovan Finn, a member of the Jackson Heights Green Alliance who lives around the block on 83rd Street, said his son's room used to face a building that was covered in graffiti before being recently cleaned. "It does seem, in the last few months, quite a bit cleaner," Finn, 41, said of the street. "It has a little better feel to it, a little more welcoming." Many of the businesses on 82nd Street have noticed the changes, as well. When the current owners of Jackson Heights Cinema opened at 40-31 82nd St. in 2010, the streets were filled with trash, manager Shaffie Balgobin said. He wasn't aware that someone could rectify the situation, however, because the BID's former administration had made no attempt to contact them. "I didn't know anything about them," Balgobin, 33, said. "Until Seth came, we didn't even know there was an 82nd Street BID." The most important challenge taken on by the 82nd Street Partnership, Balgobin said, is communicating to the general public the area's stark change, something Salma Jewelry Store owner Maged Rashwan has seen first hand. Rashwan's shop is located at 40-40 82nd St., directly across the street from Dunningham Triangle, which he remembers as a center of dangerous activity. "It was a drug hub," Rashwan, 32, said. "It's been cleaner and safer." Now local businesses want others to see that change, and after working with local politicians to secure $200,000 in capital funds from the city, the 82nd Street Partnership began its outreach campaign. They held meetings in August asking local residents what they'd like to see done with the triangle. In September, they held the first annual Via La Comida! Festival, where hundreds of Jackson Heights and Elmhurst residents came together to celebrate the area's vibrant culture. But some of the businesses also acknowledge that there's plenty of work to be done, especially south of Roosevelt Avenue, where the shops are smaller and the architecture and infrastructure is not as advanced. "I think it has some catching up to do," Taylor admitted. "So we've been focusing a lot of our efforts on thinking of ways to soften that barrier between both ends of the district." Bastida, meanwhile, said the Partnership's recent efforts gave him enough optimism to expand his business. Last week, he opened his second office, a 6,200 square-foot space just a few doors down on 82nd Street. He hired two new dentists and two assistants, and soon plans on expanding again to the building's second floor. "They're really trying to improve 82nd Street," Bastida said of the Partnership. "And we need it."